Because of its strategic location on the border of the Atlantic and near to the Straits of Gibraltar, the ancient city of Cadiz was fought over by many ruling forces, each trying to establish a foothold on the Spanish mainland. The Phoenicians set up camp there in around 1100 BC. By 500 BC, the Carthaginians had captured the coveted location and the Romans did the same two hundred years later. With the fall of Rome, so went Cadiz. The Barbarians, Visigoths and Moors all battled for the important location until Castile’s Alfonso X’s forces arrived in the 13th Century AD, where he and his Christian soldiers subsequently conquered Cadiz. Under the powerful reign of King Ferdinand V and Queen Isabella I, Christopher Columbus set sail for the New World from Cadiz. This opened up the city of Cadiz s a major trade route through which colonial treasures found their way into the Spanish culture. The Puertas de Tierra divides the city in two. 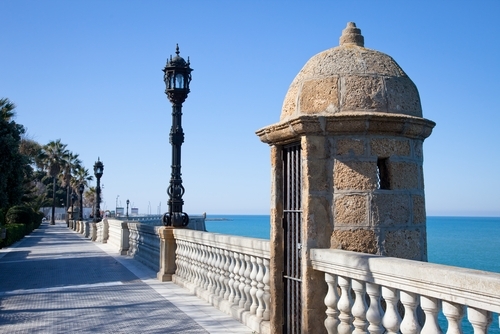 Modern Cadiz lies on the isthmus, whilst the historical section lies on the other side. The old districts of El Populo and Santa Maria are a jumble of narrow-lined streets and old stone walls, which are in sharp contrast from the parks, gardens and wide boulevards located in the busy commercial area of the city. The massive Cathedral located on Plaza Pius XII is classed as one of the main landmarks in the city due to its twin towers and represents a lot of the city’ illustrious past. 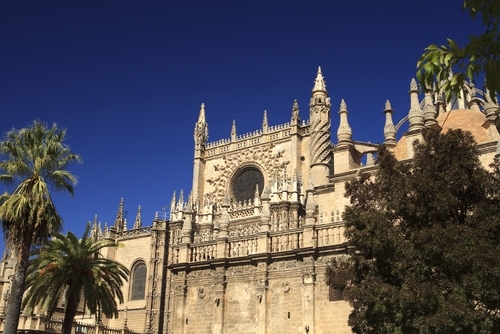 Cadiz is the gateway to the beautiful city of Seville, the capital and largest city within Andalusia. The city is a prominent business and tourism district in Southern Spain, and there is simply something for every type of visitor. From museums, art galleries and vineyards to theme parks and lush open spaces, including the popular Donana Natural Reserve, a UNESCO World Heritage Site. 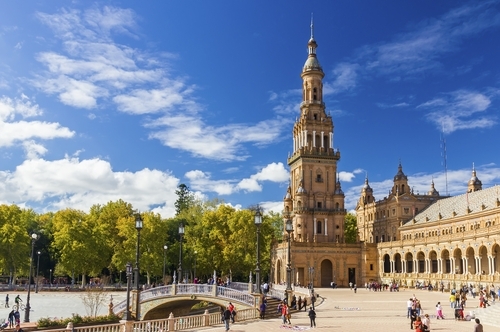 Many people flock to Seville for the Easter Week celebrations and Feria de Abril (the April Fair), both of which have become popular events of interest by the Spanish tourist board. In Seville, we recommend a visit to the Plaza de Espana (pictured below), a bustling square in the centre of the city which provides the perfect photo opportunity on a glorious summer day to capture the design and artchitectural magnificence of the local government office and to sit on a bench and watch the world go by. Certain scenes from Star Wars: Episode II were also filmed in this location. We also recommend a visit to the Giralda Tower, one of the last remants of Moorish influence within the city. Back in Cadiz, your cruise ship will usually berth at the Muelle Alfonso XIII pier, which is roughly a 5-minute walk into the city centre. This is where you will find an array of open spaces, shops, bars, restaurants and churches, including the massive Cathedral and the Church of Santa Catalina. Additional points of interest within Cadiz include the church of San Felipe Neri, known throughout Spain as the place where the provisional government set up its own liberal Constitution. 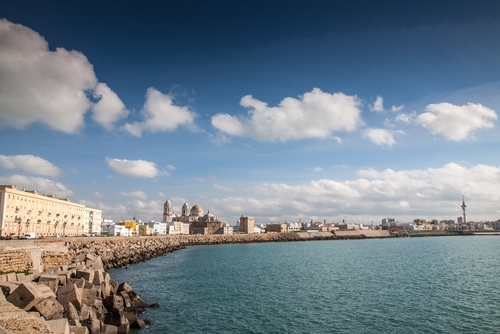 We would love to know what you think of the beautiful port of Cadiz, gateway to Seville. Tweet your thoughts to @LuxuryCruiseCo with #Cadiz.